Jack Marcus (Clive Owen) is a scruffy alcoholic teacher in a private school, keeping is job by virtue of his past reputation as an author and a poet. When he meets the new arts honours teacher, Dina Delsanto (Juliette Binoche) he is attracted, and like his own under-evolved student, proceeds to torment her as a way of showing his affections. The result is a war between the teachers, fostered by the students; a war between the art of words and the art of pictures. Both teachers struggle with their own demons as they try to push their students to be their very best, and to resolve their own competition. There is a subtle reference to Peter Weir's Dead Poet's Society in student Swint's calling Marcus "Captain", and the theme is similar. How does a teacher inspire students? What is the purpose of poetry? or words? 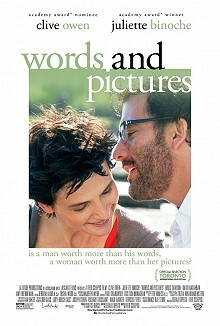 Words and Pictures, with its romance and its plot line of the challenge, keeps one's interest and proves in the end that there is a satisfactory resolution. Ultimately it is not how we communicate, but that we communicate that matters, and Marcus and Delsanto have to learn that.